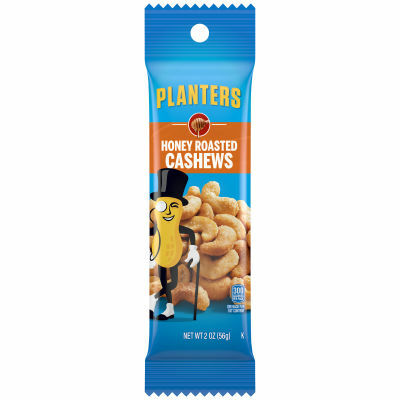 Planters Honey Roast Cashews - A perfect blend of salty & sweet flavors, combined with the crispy & chewy cashews is the perfect snack to tantalize your taste buds. Cashews is the best choice when it comes to smart snacking. With multiple nutrients and flavor, these nuts can be savored to satisfy your snack cravings anytime, anywhere. Premium quality nuts, honey roasted to perfection, Planters Honey Roast Cashews are perfect to satiate your between meals craving. Bursting with sweet, salty flavors and multiple nutrients these nuts are a must have to fix your snack emergencies. You can add these scrumptious cashews in your salads to make it more interesting. Serving size 1 package (56g).